At my table, this morning, I sat wedged between two awkward conversations at the tables either side of me. It was a very small cafe and so the conversations were not only very awkward but also very close. I was just beginning to zone out of that conversation and start to focus on catching up on my required course reading ‘How People Change’, when a mother and son arrived to sit at the table next to me. The awkwardness reached a whole new level. It was all your worst nightmares about generation gaps, teenage self-esteem, needy mothers, frustrated but loving sons, conflict management, awkward silences, Mars and Venus – all wrapped up into one! I don’t normally have the urge to interrupt people’s conversations at neighbouring tables. Actually, I do. I did manage to resist, but there were so many things I wanted to say. So many books I wanted to recommend. So many questions and conversation starters I wanted to contribute in order to overcome the awkwardness. Then I remembered that I wasn’t Doctor Phil and that, actually, they hadn’t asked me to pull my table 10 centimetres over and join them for Eggs Benedict. So I went back to trying to read my book. It didn’t take me long to reflect that the awkwardness I felt sitting between two tables of awkwardness was because their struggles with mistakes and intolerances and the desire to reach out and connect with the world, were my struggles too. It felt pretty hopeless sitting there between the tables. I refrained from ordering a second coffee, but I did finish the chapter I was reading my book. The chapter reminded me with startling clarity that the only hope for change – at my table and their’s – was Jesus Christ, one who gives new life. He comes to take up residence in our hearts and gives us the power to become the people he made us to be. He gives us the help to change. We don’t have the strength to do it ourselves – not for much longer than the gap between the delivery of a latte and a toastie, anyway. We needed his help at all three of our tables! We also need the encouragement of others. Perhaps I should have lent across and joined in the conversation? Probably not. But it did make me reflect on how we long for feedback and advice and encouragement and connection to help us through this life that can be very awkward at times. Over the past few months, I’ve been nominated for two blogging awards. As far as I can tell these are not official ‘awards’ but rather friendly ways of connecting bloggers with one another and recommending sites that you’ve enjoyed. For me, it’s not so much the award nomination, as it is knowing that someone has read what I’ve written and found it helpful in some way. I’m meant to nominate fifteen other blogs for the awards – but I’m afraid I’m still finding my way around this world of blogging. I can say with all honesty that the two women who nominated me have been two of the most inspiring writers I’ve read as I’ve been on this little journey of discovery. I’ve also been introduced to bloggers that they enjoy. Take from the sticks to the bricks and back again as an example. So I’m delighted to mention them here. Thank you to Chaos Girl for nominating me months ago for the Very Inspiring Blogger Award. I have missed reading your posts recently. They often hit home right when I needed them. Hope to hear from you soon! Thank you to The Reluctant Baptist for nominating me for the One Lovely Blog Award. I have enjoyed your different perspectives on life and faith and, as you know, your words have been quite poignant for me at times. Though it can feel lonely at times, this blogging business, it has been an unexpected pleasure to read the thoughts of strangers who are both like-minded and different to me. I shall continue to enjoy that. The reflections of these new blogging friends, and the reflecting I do with Jesus at the centre of my life renewing and changing me, shall travel with me alone, with friends, or wedged between two tables of awkwardness. 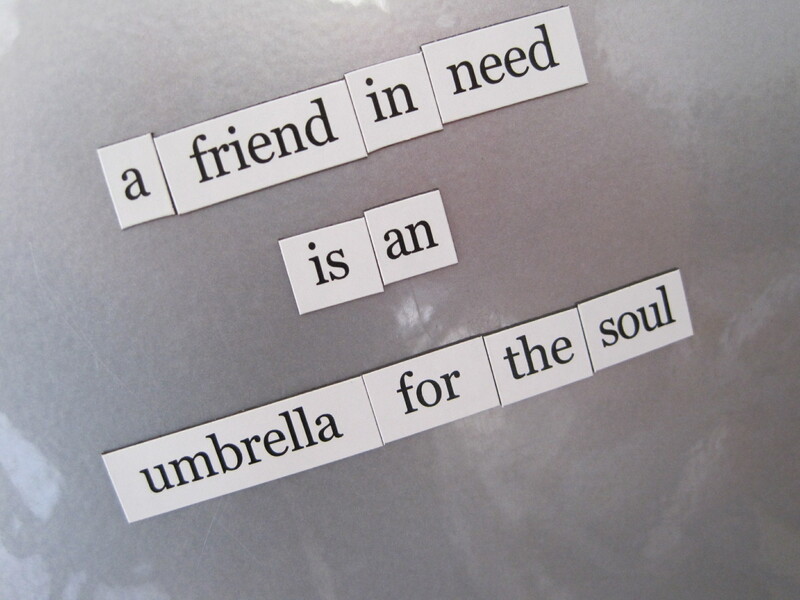 A Friend in Need – Indeed! Or was it that a friend that is there for me when I was in need was a friend indeed? Or was it that a friend who was to help me in my time of need would have to be a friend in deed? Anyway, all this to say that in the last couple of days I have had some friends in my need and they have been friends indeed and in deed! Friends sent a new magnetic fridge poetry set to replace the one I had lost in an episode with no poetic justice to speak of. There’s only one ‘friend’ and no ‘indeed’ in the set. They sent the poetic magnets via friends who offered ears (to listen) and a beautiful meal (to eat). A friend dropped by earlier today with cheery pink flowers from her garden. 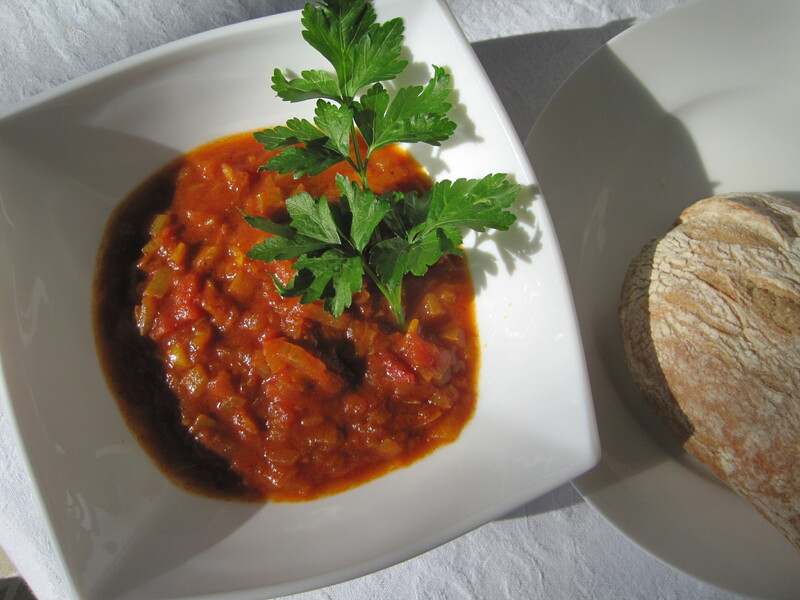 Inspired by the Cookbook Guru to explore the cookbook of the month, ‘Saha’, I made the ‘Spicy Tomato Soup’ for dinner last night and had leftovers just now for my lunch. I actually remembered to take a photo of it (long-time readers of this blog will know that I’m trying to make an effort here) and I thought that I was being all ‘foodie-arty’ by adding a garnish of parsley….but then realised that I must have been subconsciously inspired by the blog post with photo that I had seen this morning. Take a look and judge for yourself. Tonight I have a friend coming over for a simple dinner of chicken soup. I made the stock last night, from the recipe in ‘Saha’. It was made from the frozen (and defrosted) carcasses and bones from past ‘Marcellan’ meals. I’ve never made chicken stock or chicken soup before. Tonight I ate a bowl of bircher muesli for dinner. Across the table sat a good friend, eating leftover flourless chocolate almond cake. I had grated apple on my muesli and she had whipped cream on her cake – so I do believe that, between us, all the main food groups were covered. Monday it was a boat-ride up a river (not too ordinary, I admit), a packet of ‘Mini Cheddars’ in the sunshine, a proper roast lamb dinner with vegetables, and berries from the garden for dessert. Tuesday, my friends took me to marvel at the local wind turbines, the cows, and the seals with their noses poking out of the sun-soaked, sparkling sea (alas, no seal waved its flipper at me). That evening, back at home, I had fourteen women over for dinner – plates of beef stew and rice balanced on our knees. Today, I had my old friend visiting. We walked, we talked, we hung out washing and got excited when it dried (on the same day it was washed!). We ate lunch, sat in the sun, talked some more, walked some more, then had the above-mentioned bits and pieces for ‘dinner’ before leaving her to take the long bus journey back home. All so ordinary – yet all so perfectly lovely. A thread of God-centred conversation was embroidered through each of the three days. Each and every one of us, speaking something of God and his place in our lives. Today, over soup and sandwiches and a shared piece of berry cake (you’ve got to get those five a day in! ), Christina and I both spoke of how we longed to experience more of God in our lives. We were trusting that he’d fill that longing and that we’d know him better. We both confessed to having settled for such a ‘safe’ experience of him in the past. We want more of God in our life – and yet we reminded each other that would likely be experienced in the very mundane, day-to-day realm of our lives. It won’t necessarily be ‘shouts’ but very likely whispered reminders of his word and the ‘not-so-safe’ work of his spirit in us each day. Nothing startling happened these past three days – they were three adequate days. Yet they were three perfectly adequate days. Days filled with longing to know God better, and experiencing some of that longing filled in the wonderfully, ordinarily adequate provision of friendship, sunshine, conversation and daily bread. The ordinariness gave space to notice God’s presence with us – space that the spectacular doesn’t often afford. I’ve begun thinking these past few days, about how to make more of my ‘perfectly adequate life’ – and encourage others to do the same. I have a few ideas. Please do comment below if you have ideas of your own! At my table, sat a fellow confessor. She, like me, confesses Jesus as Lord and has absolute faith in God and his rule over this world and over our lives. Yet she, like me, had another confession to make. We confessed to having those moments, admittedly only briefly, where we wonder if it’s all an elaborate hoax. Do we believe in a God that’s in control, simply because we’ve been told it all our lives? Or because the alternative is unbearable to contemplate? Or because we draw comfort from a sense of purpose behind everything…even if, maybe at that very moment, it seems there may not be such a purpose at all? Our whispers were a little frightening. We were confessing that we don’t know it all – or perhaps (more likely) that we don’t like what we do know – not at that moment, anyway. And we confessed God’s truth again to one another. We know he is exists – he is truth – and his plans are good and right. He alone holds the understanding of the twists and turns of our lives – those unexpected, uncalled for changes. He also understands and reigns over the landscape of our lives that is often painfully barren and unchanging. We’re called to trust him. And there, at that table, we called one another to trust him again. And trust can feel relatively simple for that moment – sitting, confessing together. But what about the next moment? And the moments stretching ‘endlessly’ beyond that moment? If his confession had ended there, we’d have no sort of Saviour to follow – we’d have a sympathetic friend – but no hope – no words beyond our own words. A confession of obedience and deep trust that continued beyond the sentence of death and feelings of sorrow. But it didn’t end there. I often forget that. It only took me a train ride this morning – from my morning reading to that morning coffee with a friend – to forget the resurrection of our Saviour. His was no flat, final, resignation with no hope. But submission, endurance and obedience to death – with the certain hope of vindication. He was raised from death’s clutches to new life – our forerunner – allowing us to see and know and take comfort in a change that’s coming for us who trust and follow him. Yes, we share in his sufferings now – but we will also, one day, share in his glory – raised and changed forever! That morning I was reminded in my reading that the power that raised Christ from the dead – from seeming barren finality – is the same power that is at work in me, even now. It may not feel like it now – but my feelings rarely ‘see’ past my present circumstances. The truth is greater than my feelings. The doubts will keep on whispering – but the true confession rings loud and clear from the sure and certain resurrection event. ‘He is risen!’ – the firstborn among many brothers and sisters. He said it like he didn’t mean it. He said it like he wasn’t. At my table, in Costa, Gatwick Airport, I was sitting with two other solitary travellers. The three of us had formed a circle of gratitude and mutual care – at least, that’s how I liked to think of it. The first man was sitting alone at a table for four. In the absence of any empty tables, I approached. Me: Do you mind if I share your table? Man #1: You’re welcome to sit here. Man #1: Actually, could you do me a favour? Man #1: Would you mind my bag while I go and get a coffee? I’ve been waiting for someone to come to the table so I can go order a coffee. By now I’ve finished the long and involved task of clearing cups from the table and then he, in what I can only assume is a repayment of my kindness, takes the crockery-laden tray away. While he’s away, I dutifully keep an eye on his bag and protect his chair from a determined lady gathering chairs for a party of five. There are now two chairs left at our table. Mine and Man #1’s. Then along comes Man #2. A little less business-like in appearance, but neat, tidy and polite, nevertheless. Man #2: Would you mind if I sit at this table? Me: That chair there (indicating Man #1’s chair) is taken. But if you can find another chair, you’re welcome to share this table. And he does (find a chair) and he does (sit at our table). And Man #1 returns to the table with a coffee. And Man #2 (carefully) opens his newly purchased novel. And Man #1 (neatly) opens his newspaper. And Me, I place my Kindle (precisely) on the table. And we all read and drink coffee in solitary, companionable silence. That is until the party of five sit down at the table next to us. The silence is broken by the story of meeting the Queen. And the story is loud….. But then (finally) they leave and the three of us are, once again, in comparative silence. No exciting stories at out table – or if there are, we’re not sharing them – just courtesy, company and quiet. At my table in Little Jerusalem, Rathmines, I sat opposite a fascinating woman. She’d invited me to join her there for a quick meal before a meeting. After we’d ordered, she announced that she had recently been absorbed with apocalyptic cooking. She had my attention! Here was a phenomenon of which I’d not yet heard. I assumed it was the latest of a steady stream of dietary movements or recommendations for life enhancement through selective consumption. But no, she had come up with the idea all by herself. I checked that she wasn’t actually living with an obsessive fear of this eventuality. No, she just liked the idea of simplifying her life and diet. She was inspired by the way that an imminent end to the world could sharpen one’s grasp of reality (and their view of carbohydrates!). Subsequently, she was drawing on the dietary habits of cultures where food was limited, where people lived from day-to-day. She was practicing making meals with simple pulses and grains. She had been learning to make her own flatbread in case, one day, she had only the open fire in her living room upon which to cook. She’d mastered it – cooking her daily bread! And there, at our table, we broke bread together, dipped it in creamy hummus and enjoyed sharing plates of salads and grilled meats. And we shared stories of recent challenges we’d faced. She shared about a moment of festivity – where living in the moment had nearly caught her unawares. A moment of temptation where, thankfully, her Maker had brought to her mind words from another moment months before – words of warning from his Word. And she stepped away from the trap. She was led not into temptation and delivered from evil – but it had been a close call. Just one moment! Words exchanged. Harmless flirtations. The illusion of the promise of love, attraction and satisfaction – with no consequences beyond the moment. A trap baited with false promise. We praised God for his imminence in moments like this – for his words that come to mind if we allow them – for the strength he gave her to walk away from so much – and yet so little. And we encouraged one another to rely on his grace in the seemingly endless moments that follow these decisions – unfilled with promise and excitement. Treading the long path of obedience can make fleeting pleasures of the moment so enticing. There’s wisdom in living as if today is our last day – making and eating our daily bread. But that wisdom is true wisdom only if we keep a grasp of the life beyond the apocalypse – and the consequences of life choices before it. There is life beyond the apocalypse for those who endure faithfully, moment by moment, with a deep trust in the one who gives us both life and bread and who calls us to feast on him. Wisdom points beyond the moment – toward a time of no time, no night, no temptation – to joy that lasts forever. That woman’s moment of temptation could have ended in sorrow – would have, if she’d given in. And yet she chose wisdom. And those seemingly unending moments of pain that can follow these costly decisions to trust our Lord?…they too will come to an end. Wisdom is found in living in this moment, aware that it could be our last, living it faithfully with a vision of life beyond the moment. It’s simple wisdom – daily bread – feeding us for our promised, certain future.